Yeah, but: Even the Mona Lisa's falling apart. The Long Version: I've had a long and happy relationship with my Xootr kick scooter, with only one exception: the Ergonomic Locking Pin that holds locks the deck/handle joint in place. The design of the Ergo Pin is quite elegant. 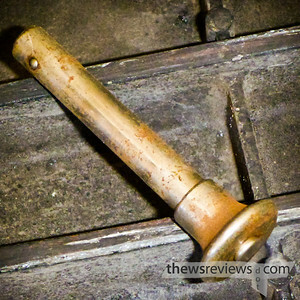 There's a spring-loaded plunger that releases the pressure on two points on the far end of the shaft, which lets the pin be removed without needing to jerk it free. After all, nobody who rides a kick scooter wants to look like they're starting a two-stroke lawnmower; as Garfield once said, "cherish the pride." The problem is that my Ergo Pin has jammed in its unlocked position. It's undoubtedly some combination of road dirt, airborne gunk, and the obvious corrosion, but despite persuasion and lubrication it's not letting go. And to make matters worse, this is a pin that I bought to replace the first one that had the exact same thing happen to it. I rode with that pin for a while despite its stickage, and just used my keys to push the plunger into place, but that's not nearly as good as having one that works properly. 1) Find a friend with an ultrasonic clean, drop it into a tub with enough liquid lubricant to cover it and let it clean. Then use DuPont Krytox to do a final lubrication. 2) By a new pin and lubricate it thoroughly before using it.